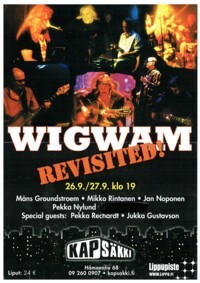 "Wigwam unplugged" featuring ex-members Måns Groundstroem, Jan Noponen and Mikko Rintanen, with guests Tommy Eriksson, Maria Hänninen and Pekka Nylund. Line-up: Måns Groundstroem, Jan Noponen, Mikko Rintanen, Maria Hänninen, Pekka Nylund, Jukka Orma. 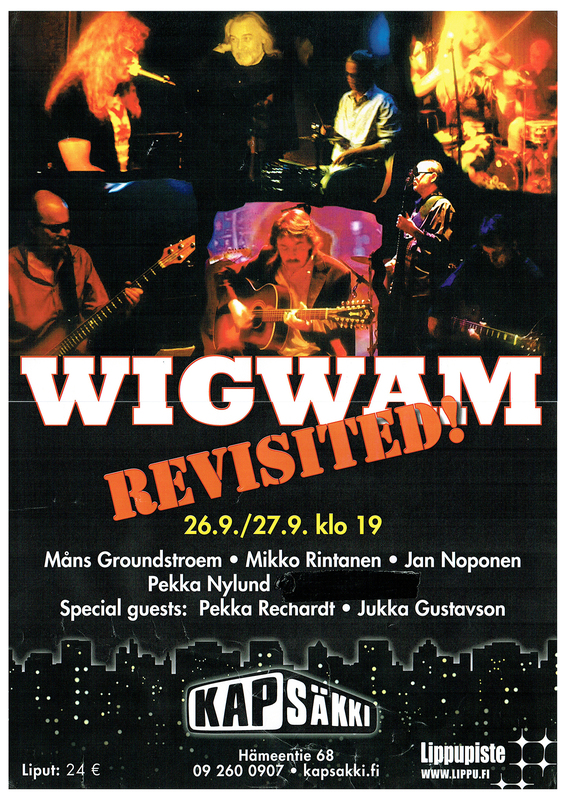 Advertised as "Wigwam unplugged", but according to Pekka Rechardt's Nuclear Netclub guestbook message 4th Feb 2011, the line-up was called "BigJam". Line-up most likely: Måns Groundstroem, Esa Kotilainen, Jan Noponen, Pekka Nylund, Mikko Rintanen. Support: Blues Oil Company. This and the next day's gig were played under the name "Wigwam Revisited". Line-up: Måns Groundstroem, Jukka Gustavson, Jan Noponen, Pekka Nylund, Pekka Rechardt, Mikko Rintanen. Most likely, the set list as above. Just My Situation | Save My Money & Name etc.